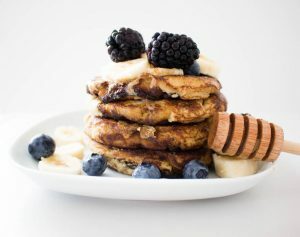 Coconut Flour Pancakes - A healthy and delicious breakfast! It took me quite some time to master the art of baking with coconut flour. The first few recipes I tried with it over two years ago were an absolute disaster. I made the rookie mistake of thinking that I could substitute coconut flour for regular flour. After a few failed attempts, I decided coconut flour was not for me and I stuck with the almond flour. 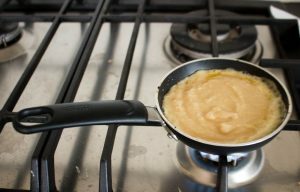 Fast forward, two years later I decided to do some experimenting with coconut flour again. It turns out that used in the correct way, coconut flour can add something really special to gluten and grain-free baked goods. For a few reasons, I have been looking to cut down on how much almond flour I consume recently. I love almond flour but eating too much can wreak havoc with me and can cause an inflammatory response in the body. In short, this healing journey has thought me continually that when it comes to food: moderation in everything is key. When I started the Specific Carbohydrate Diet (SCD) first, I was guilty of consuming WAY too many almond flour baked goods. I guess I missed the memo that this wasn’t a nut diet! These Coconut Flour Pancakes are so easy to whip up. I’ll often make a batch in the evening to bring to work for my breakfast. Quite the treat! Coconut flour is not only a healthy flour to use but it’s also quite inexpensive in comparison to almond flour. Plus, the absorbency of coconut flour means a little goes a long way. 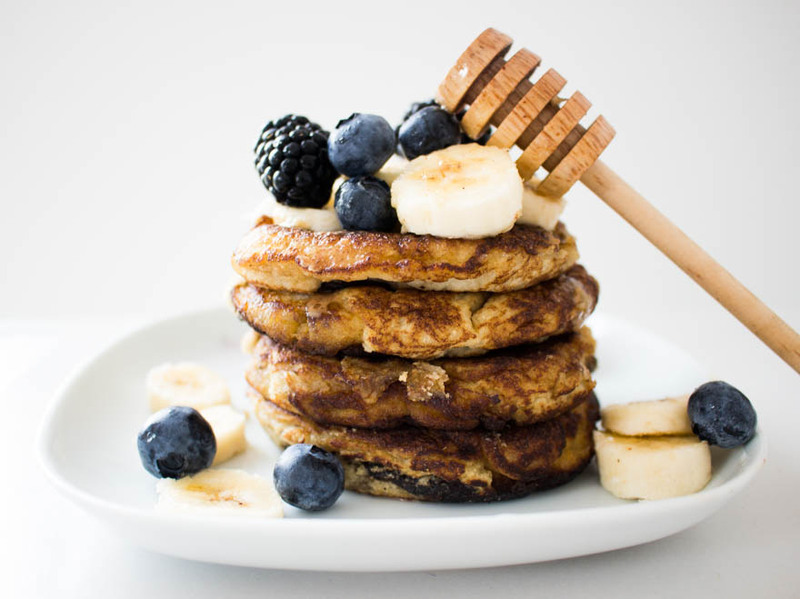 My favourite way to enjoy these Coconut Flour Pancakes is with extra honey, almond butter and plenty of fresh fruit. This is definitely a new recipe for lazy weekend breakfasts. Like we need another excuse to treat ourselves! With pancake Tuesday fast approaching, I’ll be making these for all the family. I’m thinking these would work really well with my Dairy-free No Churn Ice Cream. To make these American-style pancakes, you’ll need a little frying pan which you can pick up easily in a homeware store. It’s worth the investment to get perfectly-shaped pancakes every time. If you like this recipe, you’ll love my Brown Bread which also uses coconut flour and is free from: gluten, grains, dairy and refined sugar. Hi Maria, I am loving your blog so far. Do you get your coconut milk from a can? I find it in my local Asian food store in Ireland. Otherwise, you can make your own. Be careful with most supermarket coconut milks as they have gums added. Best of luck!